The curious link between William Kennish and PG Wodehouse!. William Kennish’s daughter Matilda bought her grand-children to England in the latter part of the 19th century to attend a singing academy, and whilst there they sang for Queen Victoria, and also visited the Isle of Man. 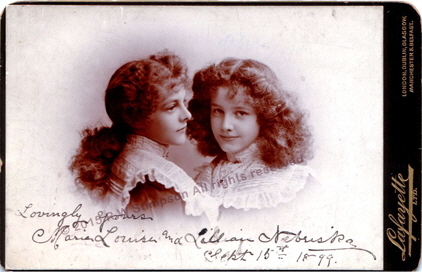 Ethel and Alice Dovey called themselves the stage name of the Nebriska Sisters - Maria-Ethel and Gillian. 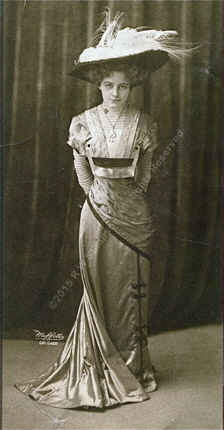 Ethel did not survive long into adulthood, but Alice returned to America and became a well known Broadway actress, marrying another well known actor Walter Truesdell. According to the excellent biography PG Wodehouse: a life in letters about English author PG Wodehouse edited by Sophie Ratcliffe and published by Hutchinson, he visited New York in 1904 aged 22. He immediately fell in love with the place, saying it was “like being in heaven without having to go to all the bother and expense of dying”. He fell in love with actress Alice - “Alice Dovey, of course, Is the nicest girl I ever met” after seeing her as a lead in the Broadway musical “Pink Ladies”. Failing to win her heart, he said in one letter in 1913 “Alice Dovey and Louise Kelly welcomed me with open arms. I have got over my little trouble re first-named & we are the best of friends. She is too devoted to Hamilton King for me to form a wedge & break up the combination, so I gracefully retire.” However he was heartbroken to fail to win her affections. Later letters presented by Sophie Ratcliffe reveal that Wodehouse was heavily influenced by her to the extent that “I shall never forget how wonderful she was, with her charm, and her sense of comedy, and her beautiful voice. All the heroines in my books are more or less drawn from her”. Alice is mentioned many times in his letters which are faithfully reproduced in Sophie Ratcliffe’s excellent book. So Henoria Glossop and many other Wodehouse leading ladies have characteristics derived from the great-grand-daughter of William Kennish! 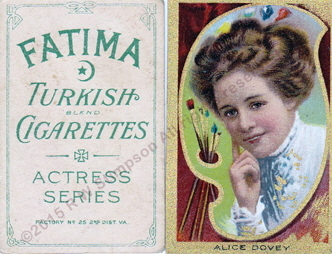 Hamilton King (mentioned above) was the illustrator famous for his actress portraits on cigarette cards as seen here. All of the photographs / images here were provided by American relatives of William Kennish and are copyright. The details above were first published in the Guardian Newspaper on Friday 4th November 2011, and further information can be found at Random House and using ISBN Code 978-0-091-79634-1. See also Amazon and other good booksellers.